150W power inverter with multi charging stations and safe protections, lightweight and compact designed, convenient and safe for car users to charge electronic items including car electronics and household appliances for trip and emergency. 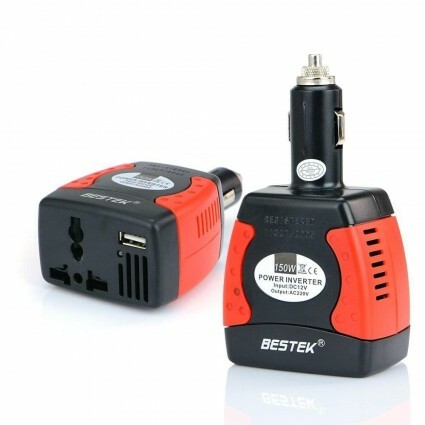 BESTEK power inverter can provide 150 watts continuous DC to AC power and 360 watts of peak power, featuring 1 AC outlet and dual USB charging stations, to keep your any electronic device on the go. 1 AC outlet and one 2.1A USB port can meet your multi charging requirements at the same time, ideal for smartphones, tablets, GPS units, battery chargers, DVD players, MP3 players and other mobile devices. Ultra compact and lightweight designed, the 150 watt power inverter is portable with no additional wires or assembly required, space-saving and easy storage. It is so universal that can directly be plugged in any 12V cigarette lighter socket. Built-in cooling fan, full protection and auto-shutdown sleep your appliance and car from overheating, overloading, low load, short circuit, low voltage and over voltage. 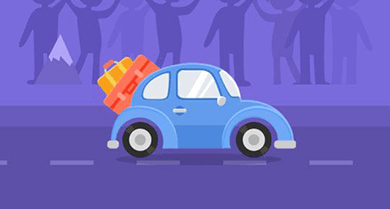 (Applied for a 12V car but not 24V). Rated Power: 150W, Max Power: 180W, Peak power: 360W. Indicator: Dual Color LED (Green-Operation, Red-Shutdown). Over Voltage Shutdown: DC15V-16V, Low Voltage Shutdown: DC10V-11V.